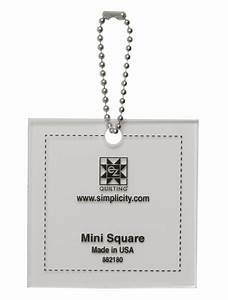 Mini Square 2.5″ quilting template doubles as a key chain! Use with jelly rolls template and other EZ Quilting tools for creating intricate designs from fabric scraps. All goods are sent via Royal Mail 2nd class signed for. Returns are not accepted unless goods are faulty. If you are not satisfied with your purchase please contact us within 7 days. If you are in possession of the goods you are under the duty to retain them and take reasonable care of them. You must send the goods back to us at our contact address at your own cost (unless we delivered the item to you in error or the item is damaged or defective) as soon as possible once you have canceled the contract. We reserve the right to make a charge not exceeding our direct costs of recovering the goods if you do not return the goods or return them at our expense. Once you have notified us that you wish to cancel the contract by telephone or by email, any sum debited to us will be refunded to you as soon as possible and in any event within 30 days of your cancellation. Please note: We carefully take photographs of all our stock, in natural light where possible. However, there may be a variance in the colour you seen on your computer screen and the actual colour of the fabric when it arrives. All notices you send us must be sent to the contact details on this website. We may give notice to you at either the email or postal address you provide to us when making a purchase. [Notice will be deemed received and properly served 24 hours after an email is sent or three days after the date of posting of any letter.] In providing the the service of any notice, it will be sufficient to prove, in the case of a letter, that the letter was properly addressed, stamped and placed in the post and, in the case of an email that the email was sent to the specified email address of the addressee. All PDF and paper patterns belong to L&C Fabrics and are sold for individual and home use only and not for commercial or manufacturing purposes. Theyare not to be copied or redistributed. All rights reserved. These terms are governed by English law. Any contract for the purchase of goods from this site and any dispute or claim arising out of or in connection with any such contract will be governed by English law.